The EHF Arbitration Tribunal, the last instance of the internal legal system of the European Handball Federation, made its decision in the case of Gunnar Prokop. The EHF Arbitration Tribunal dealt with the case of Hypo Niederösterreich’s team official, Gunnar Prokop, who committed an act of serious unsportsmanlike conduct on 29 October 2009 at the EHF Champions League game between Hypo Noe and Metz Handball. Gunnar Prokop entered the playing court at 59 minutes and 53 seconds of the match at the score 27:27 and collided with a player of the French club in order to prevent a scoring opportunity. Due to serious unsportsmanlike conduct, violating the fundamental principles of Fair Play, respect and sportsmanship on which handball is based, Gunnar Prokop shall pay a fine of €45,000. He will be excluded from all international handball competitions and from any EHF activities for a period of three years. Furthermore, he is banned from taking any EHF function for life. The club Hypo Niederösterreich shall pay a fine of €30,000. The point gained by Hypo Niederösterreich against Metz Handball shall be deducted. 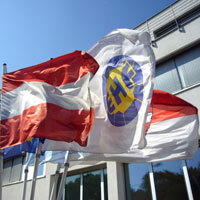 The decision of the EHF Arbitration Tribunal was based on the careful evaluation of reports and statements. The legal body found that the action of Gunnar Prokop not only limited the chance of the opponent team to score, but also endangered the player of Metz. In addition, following the game Mr. Prokop confirmed his intention to influence the final result. This action caused damages to the image of handball and to the EHF Champions League in particular. Regarding the responsibility of the club Hypo Niederösterreich, the EHF Arbitration Tribunal underlines that clubs are accountable for the conduct of their players and officials. In line with the EHF Arbitration Regulations, a statement of claim may be filed at the EHF Court of Arbitration within 21 days.